23-piece Wilton Cupcake & Cake Decorating Set Only $14.60 + Eligible for FREE Shipping! If you like to bake, you're going to love this deal! Right now, Amazon has a 23-piece Wilton Cupcake & Cake Decorating Set priced at just $14.60! Plus, you'll get FREE shipping with Prime or a $25 order. 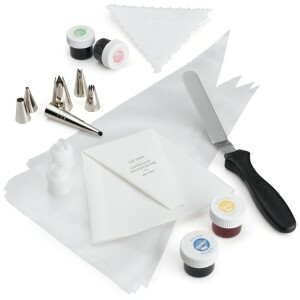 (or you can look under "More Buying Choices" to get it for $17.76 with free shipping) This set includes 6 tips, decorating triangle, spatula, 2 couplers, decorating bags, icing colors and an instruction booklet.